Retinacular cysts are small cysts that occur just below the skin on the palmar side of the joint at the base of the finger. These cysts are treated by Dr. Peter G. Fitzgibbons, MD at The Centers for Advanced Orthopaedics: Maryland Orthopedic Specialists Division. Dr. Fitzgibbons performed fellowship-training in hand, wrist, and elbow surgery through the Harvard Hand & Upper Extremity Fellowship based at Brigham & Women’s Hospital in Boston. 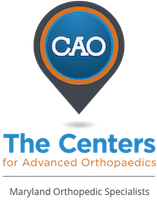 With locations in both Germantown and Bethesda, Maryland, he and a team of orthopaedists, hand therapists, and physical therapists offer a comprehensive range of services covering the diagnosis and treatment of retinacular cysts. What is a retinacular cyst? A retinacular cyst is a small fluid-filled sac that arises from the tunnel that the tendons that bend the fingers into the palm run through. They are not tumors and are self-limited in size. Often they feel like a hard pea-sized lump at the base of the finger. Retinacular cysts rarely get in the way of motion or are painful by themselves. If left alone most eventually resolve on their own. If they are not bothersome, nothing needs to be done. What are the treatments for a retinacular cyst? Sometimes retinacular cysts are bothersome to people when they gripping a handlebar or other object tightly. One option is to try to inject the cyst with fluid, usually a local anesthetic, to try to disrupt the cyst and get it to go away. This sometimes, but not always, will resolve the problem. Definitive treatment is with a minor procedure in which the cyst is excised. What is retinacular cyst surgery like? Surgery for a retinacular cyst is an outpatient procedure and is usually done with local anesthesia. Dr. Fitzgibbons performs most of these procedures at the Massachusetts Avenue Surgery Center, an outpatient surgery center that provides a safe, patient-oriented experience in a friendly and comfortable environment.